I spent some time this weekend entering descriptive information about my WatchLists and scans in the glossary from this blog. Those of you who have TC2000 can join my Club and access several WatchLists and EasyScans that I have published (access my club in your library tab). For example, I have a WatchList called Alltimehighs. You can now access this WatchList to monitor or run some of the scans I have developed that search this list for promising stocks. My Darvas scan, described in the glossary , identified 53 stocks this weekend. One of these, IRBT looks interesting to me. It had a GLB to an all time high in late October, then rose to around $60. It then entered a 5 week consolidation. IRBT showed signs of renewed strength last week. IRBT reports earnings on 2/8. I have a small position. IRBT has a maximum RWBCount of 12 (of 12). 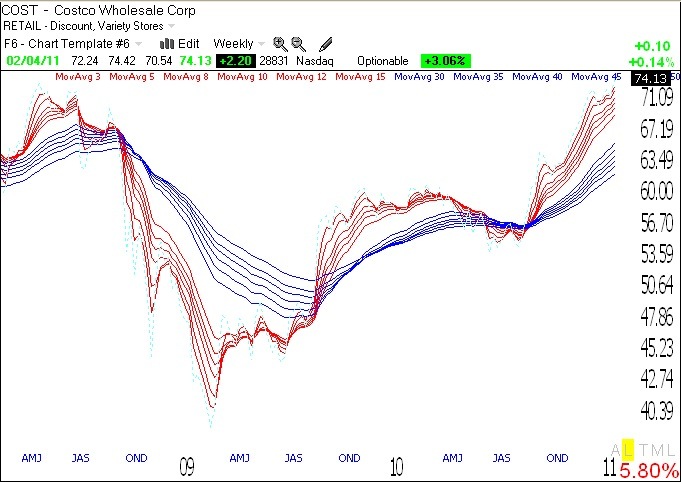 All of the weekly moving averages line up properly. 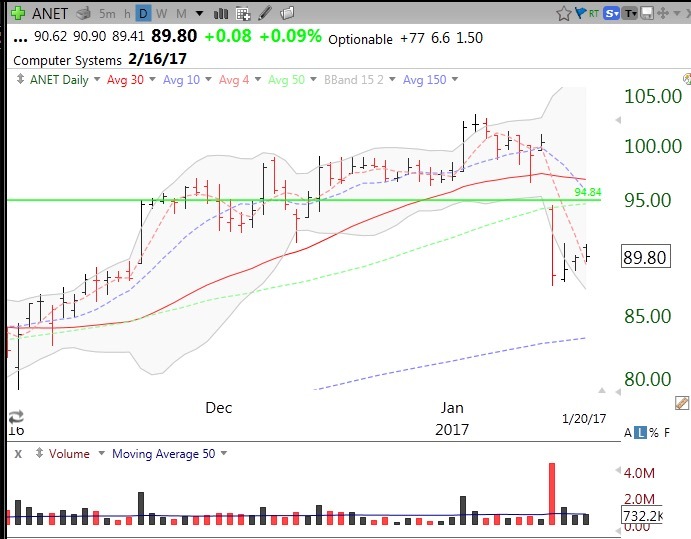 In early January, I tweeted intraday that a recent GLB stock, ANET, looked like it was moving up on above average volume. Seven days afterwards ANET gapped down on huge volume on some bad legal news. 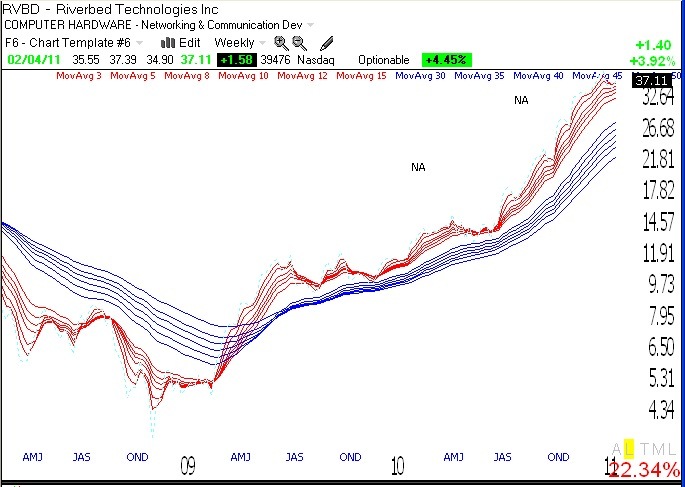 I saw no technical indicator that warned me in advance about this significant decline except for the fact that the stock traded back below its 30 day average (red line) a few days later, but it bounced. Also, the fact that the rise I wrote about only lasted for another day and the Bollinger Band expansion failed to continue were other signs of possible weakness. Technical signals can give me an edge, but they are not perfect. That is why I take small initial positions and only add to them if they prove themselves. If I owned ANET I would not sell now unless it fails to hold the recent support it had below its lower Bollinger Band, around 87.50. 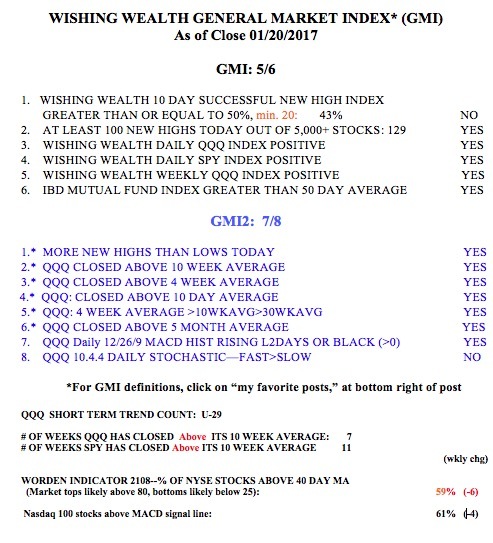 The GMI remains at 5 (of 6) and on a Green signal. The QQQ short term up-trend has now lasted 29 days (U-29). I am reprinting below some of my writings from a few years ago in order to give my new students some understanding of my approach to the market. If anyone tells you that the market is different today, refer them to the successful traders from the 1929 post-crash era–Livermore, Baruch, Loeb. Darvas, who made his fortune in the 60’s, clearly learned something from Neil’s original writings–and so have I. (See list of books about these people to the lower right of this page.) Livermore used to say that when you have a losing trade, you were paying the tuition required by the market. As a college professor, I sometimes see students who pay tuition (more accurately, their parents pay) but are not focused on learning. Losses can provide knowledge–but you have to study them. Perhaps the most important thing I did a few years ago was, after a series of losing transactions, to print out their charts and write down my precise buy and sell points. It looked like I had followed exceptionally accurate rules that flawlessly led me to buy at the top and sell at the bottom of moves! So what did I do? I reversed what I was doing and began to trade profitably. Every great trader (including IBD publisher William O’Neil) urges us to study our losses. However, most of us rarely do this important exercise in the market, or in other areas of our lives. So, one of the major exercises that my class completes during the semester is to trade for nine weeks in a trading simulation with a pretend $100,000 margin account. They must keep careful records of all of their transactions and analyze them after the trading simulation ends to determine the technical mistakes behind their losses. They then revise their rules for entering and exiting positions. We should all review our transactions at least once per year…….. Meanwhile, the GMI and GMI-R remain at their maximum values. These two sets of indicators keep me on the right side of the market. 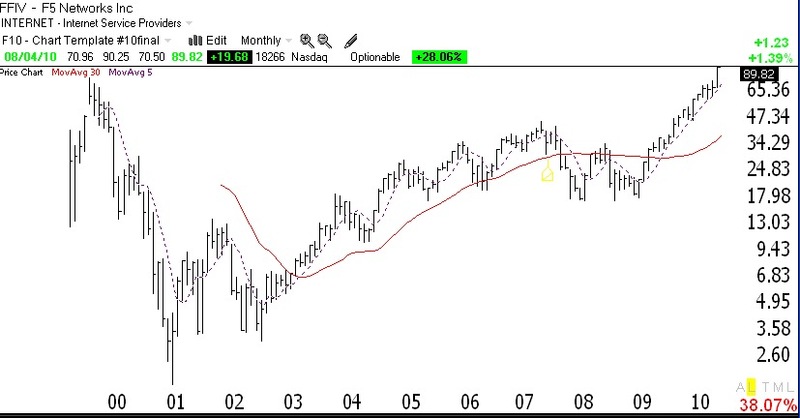 Most stocks follow the trend of the general market averages and it is absurd to fight the trend. There were 380 new 52 week highs on Friday in my universe of 4,000 stocks. Buying stocks at new highs has been a good strategy lately; 79% of the stocks that hit a new high 10 days ago closed higher on Friday than they closed 10 days ago. The QQQQ (Nasdaq 100 Index) has been in a short term up-trend for 53 days. And the longer term up-trend of the SPY (S&P 500 index ETF) and DIA (Dow 30 index ETF) has lasted for 21 weeks. The Worden T2108 indicator is at 67%, in neutral territory. 45% of the Nasdaq 100 stocks closed with their MACD above its signal line, a sign of short term strength. It is therefore okay for me to have long (versus short) positions in this market. My scan of the market has found a number of promising candidates. Below is the weekly GMMA chart for COST. 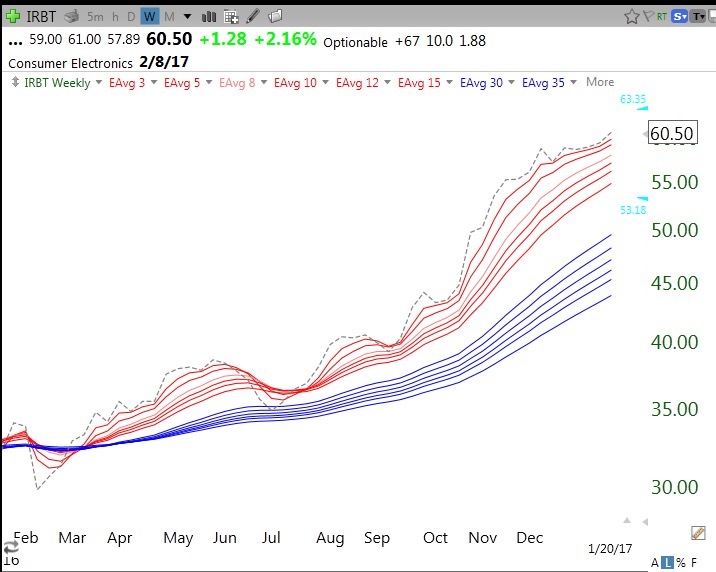 An RWB stock has all of its short term averages (red) above its rising longer term averages (blue). This is a pattern of a stock in a strong up-trend. COST closed on Friday at $74.13, very close to its all-time high of $75.23. 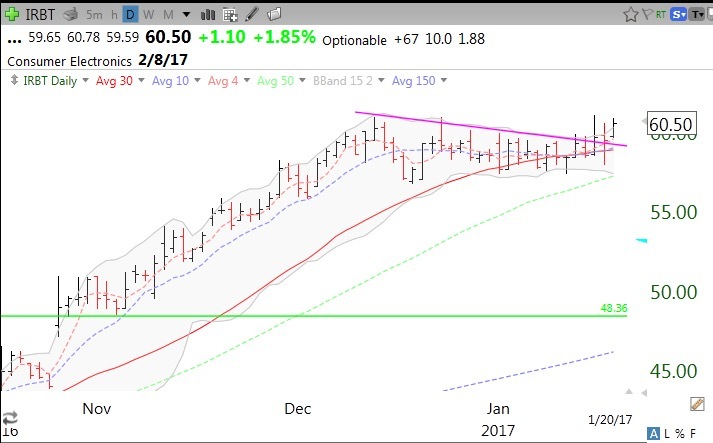 A close above $75.23 could be a sign of considerable strength for COST. COST reports earnings on March 2nd. Another RWB stock with a nice chart pattern is RVBD. It looks like it bounced off of support recently and is not far from its all-time high. If I bought RVBD, I would place a stop loss below its 30 day average, around $34.95. The two “NA’s”on the chart indicate when IBD wrote about this company in its New America column, highlighting promising visionary companies. Next earnings for RVBD come out in April. By the way, all of my students are required to get a student subscription to IBD and to read the newspaper daily. IBD provides an abundance of technical and fundamental information about the types of growth stocks I buy. Furthermore, most of my purchases come from stocks on their prior IBD 100 lists, now superseded by the IBD 50 list. I never consistently made money trading until I started reading IBD in the 1980’s. 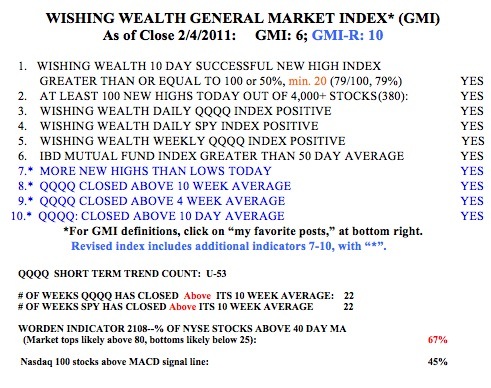 Now that the GMI is 6 and many stocks are hitting new 52 week highs again, I am looking for strong stocks to buy. As you know, I prefer to buy stocks that have already doubled in the past year and that are trading at or near their all-time highs. I also want the stock to have appeared on the IBD New America or IBD100 list. FFIV meets all of these criteria. It is also a concept stock selection of my talented stock buddy, Judy. The weekly chart has the technical characteristics I look for, although the stock is extended on a daily basis. Finally, the stock appeared on my Darvas Scan that identifies stocks that have many of the attributes he liked. Below is the monthly chart of FFIV showing that the stock has recently burst through its all-time high reached in late 1999. (Click on chart to enlarge.) I purchased a little of FFIV and will add to it if it keeps rising. Other stocks that appeared on Wednesday night’s Darvas scan include: OPEN, APKT, VIT, BIDU, NTAP, ARMH, HWK, GSIT and IDSA. I own some of these. Please do not ask me to post my Darvas Scan. In the future I will post promising stocks that come up in my scans. I am dumbfounded! I recently taped some of Cramer’s shows and reviewed Friday’s show this weekend. At about 10 minutes into his show, Cramer responded to a caller who asked him about the use of stop loss orders. Cramer ranted on about how he did not want his “home gamers” to put their orders on “automatic.” Stop losses, he said, were okay for professional traders but not for his listeners who are part-time traders not glued to the market, and who are not robots. I had to listen to him several times to make sure I heard what he was saying, because his advice was exactly opposite to what I think people should do. His reason for not using stop losses was that one might get whipsawed–buy a stock at 60, put in a stop loss order to sell if it falls to 59 and then have the stock fall to 58 and be sold out, only to reverse and close back above 60. But it is precisely the part-time traders who are not watching the market every minute who need to have automatic stop-loss orders. Traders who are glued to their monitors can watch their stock closely and manually sell when they want to. It is the part-time trader who get his head handed to him when his stock plummets while he is at work or in a meeting. In 2005, I lost a lot of $$$ profits when I went to a business meeting thinking I did not have to put a stop in on a very strong stock (TASR) I was holding. That mistake cost me big–the market always exacts its tuition, and we must learn from our mistakes. I could not disagree more with Cramer’s advice. Before I buy a stock, I calmly decide how much I will let it fall before I think I am wrong and how much of a loss I will tolerate. In this way, this “home gamer” who has a full time job, does not have to be glued to the monitor like a professional trader and can go about my business knowing that if my stock falls to my sell level I am immediately and automatically sold out. Once I have my stop loss order in place, I have taken my emotion out of the trade. If the stock falls and I have taken a small loss, I can always go back in and buy it back if it shows renewed strength–now that’s smart trading! Every small loss bring me to my next big gain. It was the use of stop losses that helped the great Nicolas Darvas (see his book below) to make a fortune in the market in just 18 months. It is how one keeps his losses small. Put this advice along side a lot of other bad Cramer advice, including calling chartists morons and recommending stocks based on fundamentals alone that were later devastated by the 2008 market decline. (I think Cramer started showing charts for a while after he found that a lot of his fundamental/value choices tanked). So, how do I put in a stop order? Before I buy a stock I determine at what level I will have been wrong. Since I am buying the stock at what I believe is the right time and assuming that it is in an up-trend, I should not tolerate much of a decline below my purchase price. The best way to enter a trade is to assume it will go wrong, so that I can calmly prepare my risk control strategy in advance. I select a price level based on prior support, at a moving average or a recent reaction low. As soon as my buy order is executed, I place an order to sell my newly purchased shares on stop at my predetermined loss price. I typically place a GTC (good til canceled order) so that I do not have to put a new stop order in every day. A day order expires at the close each day. Now, once the stock trades at the stop price level I put in, the broker automatically sends the order in to sell my shares at the market. I may or may not sell the stock at the stop order price. The order goes in line behind other market orders and gets executed in turn at the best price offered. The greatest risk from using a stop loss order is that if the stock suddenly trades far below the stop price (as in a gap down at the open the next day) one gets only the best price that someone is willing to pay. A good strategy is to cancel the stop order after the stock has advanced enough and to put a new sell stop order in at a higher exit price to ensure I do not give back all of my profit. I do not use automatic trailing stop orders because I prefer to raise the stop price manually after carefully reviewing the stock’s technicals. If I am stopped out and the stock rises again I love to buy it back at a higher price than I sold it. Such trades often are quite profitable because during the whipsaw, as the shares decline, they are bought by others who then hold on for a larger advance. Many large advances begin after a sudden decline…….